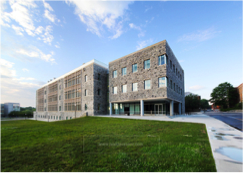 Center for Energy Harvesting Materials and Systems (CEHMS) at Virginia Tech is currently housed in a 6,000 sq. ft. facility in Durham Hall, dedicated to the administrative, educational, and technical activities of the Center. 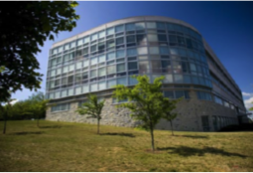 Additional CEHMS–specific lab spaces are located in Kelly Hall and ICTAS II building and Goodwin Hall for a total space of about 10,000 sq. ft. Several large facilities including a wind tunnel, a wave basin, a modal testing laboratory, numerous testing machines an acoustics facility and equipment in the fiber optics and wireless centers of the Department of Electrical and Computer Engineering are available for CEHMS faculty to perform their research. 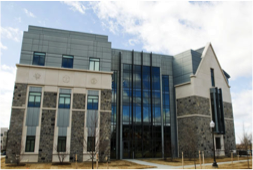 Examples of other state-of-the-art facilities available to CEHMS include: the electrical characterization laboratory, the power electronics facility, an x-ray laboratory, an electron microscopy laboratory, a mechanical testing lab, and a thermal processing and characterization lab. Facilities are also available for the processing and characterization of dielectric materials, both for bulk and thin layer forms. CEHMS has a 4-circle goniometer for reciprocal space mapping, which is equipped with a hot-stage for T-dependent studies and state-of-the-art optics and the equipment needed to make epitaxial thin-layers, grow single crystals, process bulk ceramics, tape cast layers, and to make intricate patterns using a miniature rapid prototyping method. CEHMS has an atomic force microscope, capable of operating in piezo-, magnetic, and dielectric-force modes. In addition, CEHMS has a scanning electron microscope with an environmental stage, and a new high resolution TEM. These structural tools, in conjunction with our polarized light microscope with an electric field stage, allows CEHMS researchers to characterize the structural aspects of dielectric materials at various length scales ranging from the atomic level and up. Furthermore, VT has one of the nation’s best facilities for functional property and device evaluations. These include dielectric, magnetic, piezoelectric, and magnetostrictive functionalities that are highly relevant to this program. We also have a SQUID magnetometer, magnetoelectric measurements, and a magnetically shielded test environment that has a noise rejection capability of ~105x at low frequencies. Scanning electron microscope, Environmental scanning electron microscope, transmission electron microscope, Raman spectroscopy. MicrON – clean room facilities (microelectronics, optoelectronics, and nanoelectronics): E-Beam Evaporation, Thermal Evaporation, PECVD, RIE, Deep RIE, Photo Resist Spinners, Mask Aligner, Thermal Anealer, Dicing Saw, Acid/Corrosive Wet Deck, Solvent Wet Deck, P,N and Thermal Oxide Furnaces, VASE, DekTak Profile measurement, FilmMetric, Optical Microscope, Critical Point Dryer, Wet Etching (TMAH, KOH).